The future will be Indigenous. With presentations by Elder Mary Courchene, Julie Nagam, Duke Redbird, Niki Little, Candice Hopkins, Owisokon Lahache, Mandee McDonald, Wanda Nanibush, France Trepanier, Rilla Khaled, Jamie Isaac, Keith Monro, KC Adams, Stephen Borys, Jamie Cirdo, Megan Tamati-Quennell, Joi Arcand, Tasha Spillett, Jarita Greyeyes, Serena Keshavjee, Heather Campbell, Carly Lane, Karl Chitham, Michelle LaVallee, Asinnajaq, Maret Anne Sara, Soar Nango, Jolene Rickard, Jason Edward Lewis, Scott Benesiinaabandan, Noelani Arista, Kauwila Mahi, Daina Warren, and Ruben Friend. Held in conjunction with the exhibition-forum and led by Skawennati, Jason Edward Lewis and the AbTeC production team. The series comprised four workshops across four weeks. 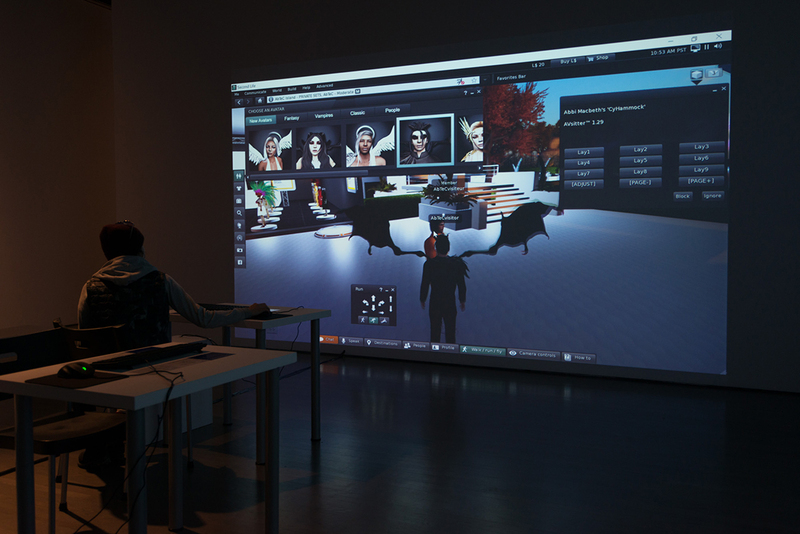 Participants were taught tools and methods in the emerging technique known as machinima—filmmaking in virtual environments. More information about the workshop series here. Filling in the Blank Spaces brings together, for the first time ever, over twenty years of programming and production by the research network Aboriginal Territories in Cyberspace (AbTeC) and its platform the Initiative for Indigenous Futures (IIF). 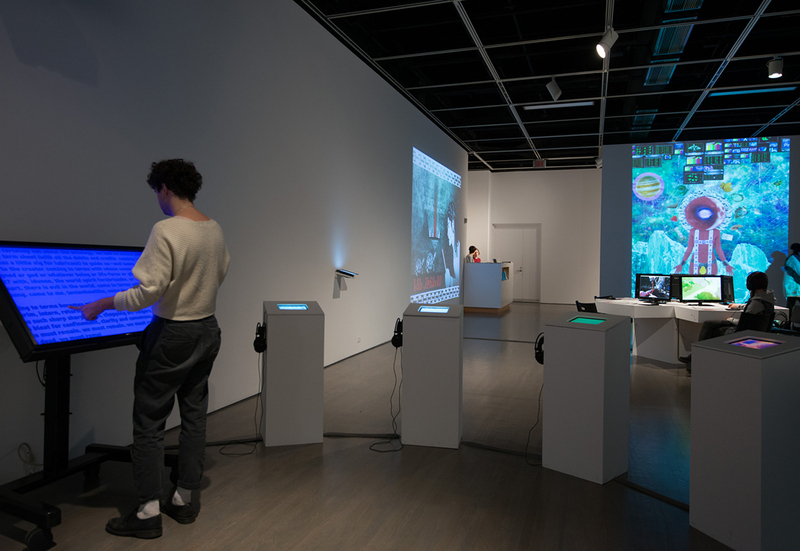 Through various media and events, the exhibition-forum animates a history of activities dedicated to developing Aboriginally-determined territories in cyberspace and imagining Indigenous peoples in the future. Filling in the Blank Spaces illustrates a multitude of ways Indigenous artists, researchers, educators, designers and community activists are creating and employing new media to strengthen and complement their cultures and communities. Somehow when you exit this site you definitely know you were in Indian territory. Writing in 1999 about CyberPowWow 2—one of the first ‘Aboriginal Territories in Cyberspace’—the Tuscarora art historian Jolene Rickard identified a remarkable affordance of the Internet: community-determined use of networked media really could migrate Indigenous ways of relating into the digital age. This was months before Jason Edward Lewis and Skawennati met, years before they married, and far before they established Aboriginal Territories in Cyberspace (AbTeC)—the acclaimed, international network supporting media arts. AbTeC was formalized in 2005 with the mandate to support and increase the number of Indigenous peoples creating digital media. For Lewis and Skawennati, and for their myriad collaborators, this was an effort to ensure that the future would hold spaces for Indigenous voices. This initial ambition has flowered through two decades of cultural work that advances long-term futures of First Nations, Inuit, and Métis peoples. From its outset, the popular imaginary of ‘cyberspace’ possessed a distinctly neocolonial ethos. From William Gibson’s data cowboys,3 to metaphors of the Internet as an information superhighway and an electronic frontier, to popular applications like Explorer, Konqueror, and Navigator, the Internet’s prevalent mythology has carried a thoroughly imperial flavour through the colonial expansion of digital technologies across the planet. Significantly, these technophiles were concerned not merely with the superficial production of images and the appropriation of existing tools, but rather were deeply engaged in the design of media themselves. As the Plains Cree artist Archer Pechawis recalls: “We saw the Internet not just as a new technology but a new territory, one that we could help shape from its inception.”5 They anticipated and revolted against the ostensible oxymoron of the digital native, in which the primitive ‘Noble Savage’ is meant to contrast the modern world of ‘the digital.’ Such self-actualizing endeavours flew in the face of clichés that misconstrued Indigenous peoples as pre-technological. This occupation of ‘cyberspace’ in the mid-nineties came at a watershed moment for Indigenous artists using digital media in Canada. A proliferation of new media arts was born alongside networks of Indigenous cultural activism,6 grassroots and institutional changes in Canadian arts organizations,7 federal task forces and commissions on the state of Aboriginal peoples and cultures,8 and the development of important Indigenous cultural media networks.9 Parallel to this groundswell of cultural reform, the popular Internet arose and became crucial to an emergent generation of Indigenous artists. The story of AbTeC takes root at this historical juncture. It is a story about a generation of artists and cultural producers, writers, activists, elders and kids, networked in technologies and in consciousness. AbTeC participates in a history of Indigenous media arts that has catalyzed artistic communities and research networks, and introduced practices of mentorship, education and collaboration. Twenty years ago—still some years before AbTeC was formalized—Skawennati initiated the landmark online exhibition space CyberPowWow. In step with the growing online activity of international artistic cybercultures and the first net.art exhibitions, CyberPowWow uniquely laid out the groundwork for a distinctly Indigenous cultural presence online.10 Running for nearly a decade, the project commissioned online artwork from dozens of artists.11 Users who visited the site could choose 2D avatars in the form of Indigenous bodies and navigate through graphical chat ‘rooms’ designed to replicate traditional and contemporary Indigenous spaces. Importantly, this was also a space to meet others online. Far before the saturated, media-rich, social-network-driven cultures of today, CyberPowWow represented an extraordinary experiment in creating online communities. A decade after the first CyberPowWow a further groundbreaking exploit came in 2008, when Lewis and Skawennati together purchased a virtual piece of land in the online world Second Life. They named it AbTeC Island. Since this time the island has been utilized as a virtual classroom, an exhibition space, and as a film set for a range of media productions, including Skawennati’s celebrated TimeTraveller™ series. 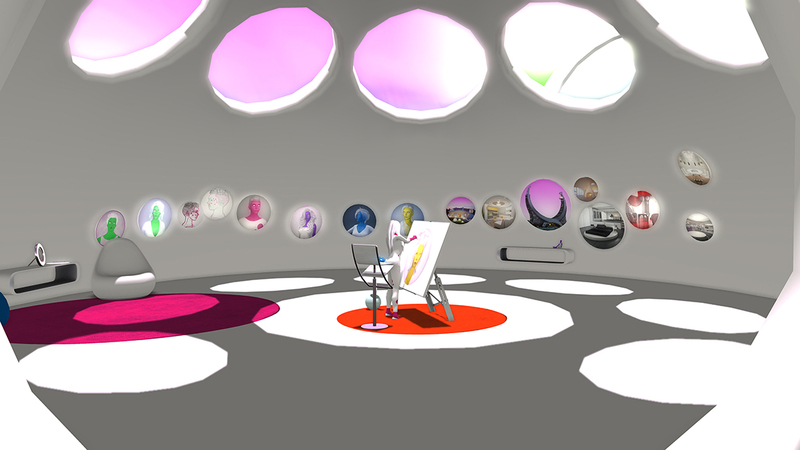 Freely accessible to the public, AbTeC Island is an imaginative assemblage of virtual landscapes and architecture.16 At varying times, visitors will find the island of Alcatraz,17 an historical Iroquois village, the Aztec Empire city of Tenōchtitlan, and futuristic houses, museums and cities. The sci-fi and fantasy appearance in many of the scenes of AbTeC Island conveys strong imagery of a future populated with Indigenous people. Outside the colonial borders of the reservation, and beyond mainstream settler imaginaries of the future, AbTeC Island is a decolonized space designed for Indigenous-determined futures. The Skins Workshops on Aboriginal Storytelling and Video Game Design began in 2009 as a collaboration between AbTeC, a high school teacher and her students, and tribal elders from Kahnawá:ke Mohawk Territory. Designed to mobilize communities in translating their traditional stories into video games, it since has spread to involve communities from Montreal to Yellowknife to Honolulu with AbTeC conducting five major Skins workshops over the past decade. We are now turning towards claiming territory in the future imaginary, or, better yet, creating our own. An expressly Indigenous vision of the future has underpinned much of AbTeC’s activities since its inception. The Initiative for Indigenous Futures (IIF)—an ambitious, countrywide, multi-partner research network—is the latest endeavour in this vision. The network is a wide-reaching project built to support a range of thinkers and creators committed to the future of Indigenous peoples. As with previous projects, the ambition is not merely to imagine the future, but to actively shape a space there for Indigenous creators. IIF engages artists, scholars, educators, and professionals from videogame, film and technology development industries to envision Indigenous peoples in seven generations—150 to 200 years—into the future. Undertaking such a wide-range of cultural activity, IIF is overseen by AbTeC and realized with partners across the country. IIF projects include: digital media workshops with youth and elders, residencies and commissions for respected Indigenous artists, the development of a media art archive, and a series of lectures, interviews and symposia highlighting prominent voices in Indigenous art and culture. Among the outputs of IIF is a series of images commissioned from Indigenous artists prompted to illustrate their descendants of the future. As they launched IIF with their partners, one of the first impulses for Lewis and Skawennati was to ask artists directly: Where do you see your community seven generations from now? The results—inventive, fantastic, and speculative—come from both younger and established artists who belong to a variety of communities and use a range of media. Some imagery is dystopic, but also envisions futures of community, kinship and harmony with the natural world. Freely accessible online, these images equally circulate as post cards. Throughout the past year AbTeC has invited a line-up of distinguished scholars to Montreal to think seriously about Indigenous futures. The Future Imaginary Lectures and Dialogues series comprises interviews, seminars and public talks led by leading Indigenous artists, activists, academics and technologists. Each contributor in this ongoing program is invited to speak from their field of study to larger, shared concerns for the future of Indigenous peoples and communities worldwide. Participants in the series include to date: Cheyenne and Arapaho technoscience and sexualities theorist Kim TallBear, Tuscarora art historian Jolene Rickard, Lakota, Black and Irish game designer Allen Turner, and Métis social anthropologist Zoe Todd. In partnership with the Indigenous film and media festival imagineNATIVE, Toronto International Film Festival and Pinnguaq Technology, IIF commissioned a series of virtual reality (VR) artworks to respond to the sesquicentennial of Canadian confederation. Turning the Canada 150 commemorations on their head, this series asks: What might this land look like 150 years from now? AbTeC produced two of these remarkable, immersive artworks. Anishinabe artist Scott Benesiinaabandan’s Blueberry Pie Under the Martian Sky was developed from an origin story recounted to the artist by the Cree Elder Wilfred Buck. In it, Spider Woman weaves a long thread from the centre of the Seven Sisters, along which the Anishinabeg travelled to earth. In another, prophetic story, a young boy will return to the Seven Sisters in the future. Blueberry Pie Under the Martian Sky follows the journey of this boy back to the Anishinabeg origin. Benesiinaabandan’s interpretation takes place seven generations in the future, when humans have developed interstellar travel through the use of wormholes. The result is a dreamscape of sometimes unsettling imagery that explores the richness of Anishinabemowin languages and their pertinence to the cultures and technologies of the future. Each Branch Determined is a VR artwork developed by the Indigenous artist collective Postcommodity.20 The project visualizes the northern New Mexican landscape 150 years into the future, at a time when a gathering of American Indian and Xicano pueblos are working together to manage their land and shared community. The project plays with tropes of sci-fi and apocalyptic imagery to create fantastic and surreal spaces. However, these spaces are revealed as sites for community ceremony and managed processes of restoration. This is a future in which Indigenous knowledge of land and kinship proves to be essential. Jason E. Lewis and Skawennati Tricia Fragnito, “Aboriginal Territories in Cyberspace,” Cultural Survival Quarterly 29, no. 2 (Summer 2005): 30. William Gibson, Neuromancer (New York City: Ace, 1985). The 1990 Kanehsatà:ke resistance marked a notable influence on Indigenous cultural activism, if only the latest in five hundred years of colonial resistance. 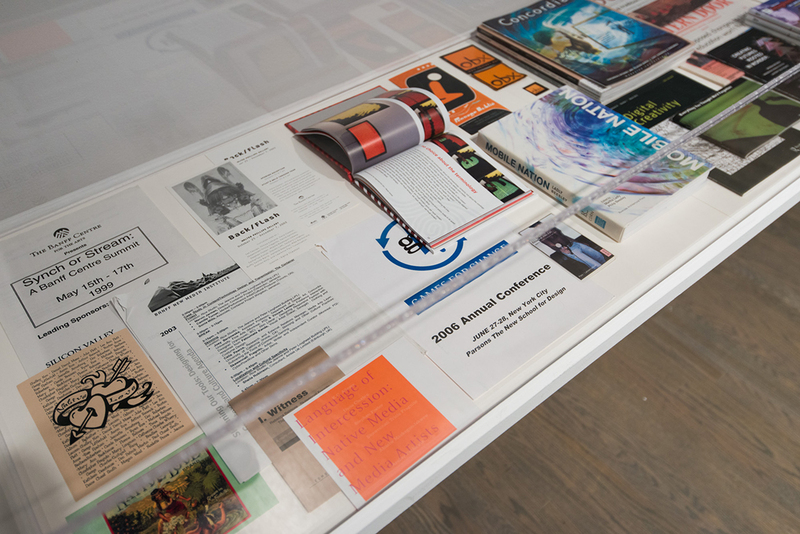 See for example, Minquon Panchayat (1992)—the anti-racist coalition which promoted the structural reformation of artist-run culture, the initiation of Tribe (1995) and Urban Shaman (1996) artist-run centres, and increased support for Indigenous artists using new media at the Canada Council, Banff Centre, among other Canadian art institutions. See for example, the Act for the Preservation and Enhancement of Multiculturalism in Canada (1985), the Task Force on Museums and First Peoples (1992), and the Royal Commission on Aboriginal Peoples (1996). See for example, the Aboriginal Film and Video Art Alliance (1991), Drumbeats to Drumbytes (1994), the Indigenous Media Art Group (1998), imagineNATIVE Film and Media Festival (1998), and the Aboriginal Peoples Television Network (1999). Canonical examples of early net.art exhibitions include Club Berlin during the 46th Venice Biennale in 1995 and dX, as part of the 1997 documenta X. The participants included in all CyberPowWows were: Âhasiw Maskêgon-Iskwêw, Archer Pechawis, Audra Simpson, Bradlee LaRocque, Edward Poitras, Greg A. Hill, Jason E. Lewis, Jolene Rickard, Joseph (Dega) Tekaroniake Lazare, Lee Crowchild, Lori Blondeau, Marilyn Burgess, Melanie Printup Hope, Michelle Nahanee, Paul Chaat Smith, r e a, Rosalie Favell, Ryan Johnston, Ryan Rice, Sheila Urbanoski, Sheryl Kootenhayoo, Skawennati, Travis Neel, and Trevor Van Weeren. These included: The Walter Phillips Gallery at The Banff Centre; EMMEDIA Gallery & Production Society in partnership with MayWorks Festival, Calgary; Tribe, A Centre for the Evolving Aboriginal Media, Visual and Performing Arts Inc. and PAVED Art + New Media, Saskatoon; Urban Shaman Gallery, Winnipeg; InterAccess, Toronto; Artengine and G-101, Ottawa; OBORO, Montréal; Eyelevel Gallery, Halifax; and Confederation Centre Art Gallery, Charlottetown. The digital divide between Indigenous and settler populations is shown by, among others, Christian Sandvig in his essay “Connection at Ewiiaapaayp Mountain: Indigenous Internet Infrastructure,” in Race After the Internet. eds. L. Nakamura & P. Chow-White (New York: Routledge, 2012), 168-200. Candice Hopkins, “Interventions in Digital Territories: Narratives in Native New Media,” in Transference, Tradition, Technology: Native New Media Exploring Visual & Digital Culture, eds. Melanie A. Townsend, Dana Claxton, and Steve Loft (Banff: Walter Phillips Gallery Editions, 2005), 136. AbTeC Island may be visited in Second Life at http://maps.secondlife.com/secondlife/AbTeC/31/231/137. On the significance of Alcatraz see: Paul Chatt Smith, Like a Hurricane: The Indian Movement from Alcatraz to Wounded Knee (New York: The New Press, 1996). Jason Edward Lewis, “A Brief (Media) History of the Indigenous Future,” PUBLIC: Art|Culture|Ideas 54 (Winter 2016), 42. Postcommodity is Raven Chacon, Cristóbal Martínez, and Kade L. Twist. The complete essay can be downloaded in the Texts and Documents section. A printed version is also available at the Gallery. Onkwehón:we Akotenatà:ke ne Owerà:ke ne tewatenróhon ne ronthiatonhseraweiénstha, ratiráhstha tánon ne ronateweiénhston ne orihwase’shón:’a nahotén:shon owerà:ke watohétstha, ne tehonóien ne ahatirihwaken’én:ion, tahatiié:na ne anonhtonniónhtshera tánon ne tsi niiontstha’shón:’a tánon nahó:ten ká:reks ne orihwase’shón:a ne Rononkwehón:we raonatinata’kekehshón:’a ne tsi tewa’á:raton, tsi waterihwateweiénhstons atswa’táhtshera tánon ne owerà:ke orihwashón:’a watóhetstha. Tsi nihotinikonhró:ten ne Rononkwehón:we nahó:ten ohén:ton tá:we ne tewatenró:hon ne é:neken ionterihwaienhstahkhwaniónkhwa, tsi ronteweiénhstha ne ratiráhstha, kanakerahseraké:ron tánon ne rotiio’ténion ne ahonnón:ni ne nia’tewatkahthohtsherá:ke ne Rononkwehón:we raoná:wen tsi nenióhton ne enióhrhen’ne, ohnaiáwen’ne sénha ioiánere tsi aionkwa’nikonhraièn:ta’ne ká:non teiotonhontsóhon niaiétewe ne nón:wa wenhniserá:te. Aboriginal Territories in Cyberspace is a network of academics, artists and technologists whose goal is to define and share conceptual and practical tools that encourage new, Aboriginally-determined territories within the web-pages, online games and virtual environments that we call cyberspace. The Initiative for Indigenous Futures is a collaboration between universities, arts institutions, community organizations and industry partners dedicated to developing multiple visions of Indigenous peoples tomorrow in order to better understand where we need to go today.